Now A Politician, Aung San Suu Kyi Is The Object Of Protesters : The Two-Way As a member of Parliament, she is now at times working alongside the government, a development that could cost her backing from her traditional supporters. Aung San Suu Kyi (right) faced protesters when she traveled to a village in northern Myanmar on Thursday to discuss a Chinese-backed copper mine project. Suu Kyi, a Nobel laureate and a member of Parliament, urged protesters to support the project, which was the scene of a violent crackdown last year. She said opposing the project would risk hurting the country's economy. Last year, Myanmar's opposition leader Aung San Suu Kyi was greeted by adoring crowds during triumphant tours of Asia, the U.S. and Europe. She eclipsed President Thein Sein, who remained in Burma, as the country is also known, and managed a series of domestic crises. This week, Suu Kyi for the first time found herself the object of popular protests at home, while Thein Sein basked in the welcome of dignitaries on a state visit to New Zealand. The stunning role reversal suggests that Suu Kyi's transition from prisoner of conscience to presidential hopeful in 2015 has reached a new and difficult phase. "If this trend continues, we're looking at the end of Aung San Suu Kyi as we know her: a political leader with massive political appeal," warns Maung Zarni, a Malaysia-based Burmese academic, who has become disillusioned by her cooperation with the current regime. "The popular perception can turn against even someone like her very quickly." Suu Kyi went to northwest Burma this week to explain a report by a parliamentary committee that she now chairs. The report recommends that the Letpadaung copper mine, which has support from Chinese investors, should continue operating, despite damaging the environment and producing few jobs for the local economy. The investors are a Burmese military-run conglomerate, and a subsidiary of one of China's largest weapons manufacturers. The report found that police were responsible for an attack that injured more than 100 Buddhist monks and other protesters. Yet the parliamentary committee did not recommend any punishment for the police. Suu Kyi told the residents to end their protests, and said Burma could not risk alienating foreign investors, especially China. Pictures show Suu Kyi looking dejectedly out of her car window at protesters weeping and shouting out their disapproval of her and her committee's report. With Honors Awaiting, Aung San Suu Kyi Visits U.S. Some despaired that the woman they call "Mother Suu" no longer loves them, and that she has dishonored the legacy of her father, Burmese independence hero Gen. Aung San. Clearly, both sides were heartbroken to find themselves on opposing sides of the issue. 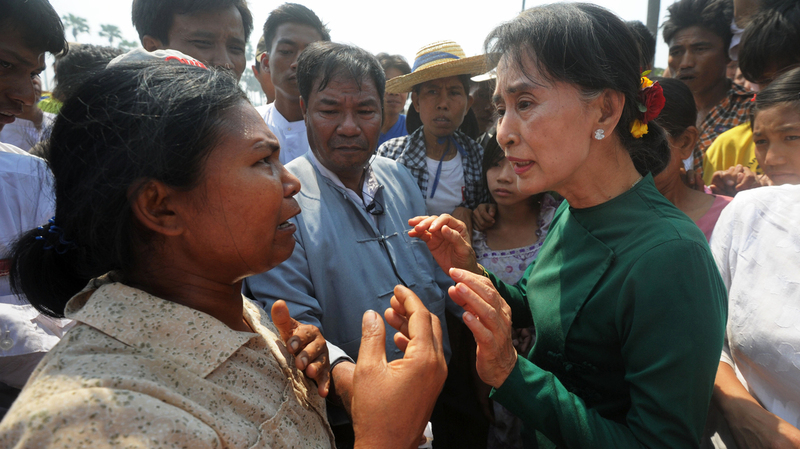 "The reality is that Aung San Suu Kyi has in a sense been co-opted by Thein Sein to share the political burdens on this and some other tricky issues," comments Trevor Wilson, Australia's former ambassador to Burma. By effectively putting Suu Kyi in charge of the nettlesome mine issue, Thein Sein's administration may be earnestly trying to share power with her, says Wilson. "But it might also be a clever ploy to show Suu Kyi in a more realistic and negative light to the Burmese people." Suu Kyi's participation in politics has already done much to legitimize the nominally civilian administration and help lift damaging foreign sanctions against it. She has also been careful not to threaten the interests of the former military rulers. She has avoided calling for their prosecution, though human rights groups say they are responsible for decades of abuses. In addition, she has ensured the military's biggest revenue source by acquiescing to foreign investment in state-owned energy firms. And she has declined to speak out on the plight of minorities, including the Muslim Rohingya, many of whom have fled communal violence in the country's west, and Kachin insurgents who have held out against pitched government assaults on their strongholds near the Chinese border. "In the popular eye, she is siding with, basically, the oppressor," laments Maung Zarni. "She built up the moral capital, and now she is squandering it herself." But Trevor Wilson notes that the mine protesters share some of the blame for failing to keep their demonstrations within legal bounds. And he adds that Suu Kyi is the victim of completely unrealistic expectations about her performance, built up in large part by the international media. NPR's Anthony Kuhn is a foreign correspondent based in Jakarta.